Every year Lancôme releases a special collection and this time it was with Proenza Schouler. The collection is colorful, vibrant, and fun. I was lucky to receive a few products to try and it is no surprise that I love them all, so I created a fun look with them. Cada año Lancôme lanza una colección especial y esta vez fue con Proenza Schouler. La colección es colorida, brillante y divertida. Tuve suerte de recibir algunos productos para probarlos y no es sorpresa que los ame todos, así que hice un look con ellos. 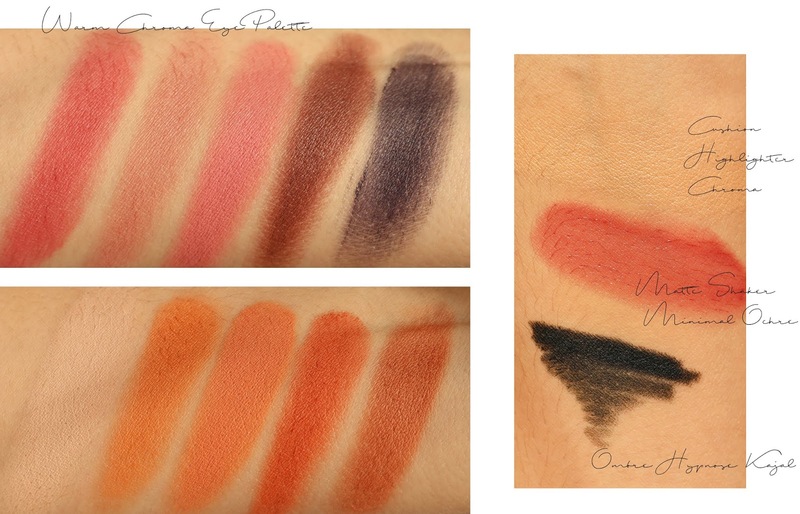 The Proenza Schouler Fall Color Collection for Lancôme is a very colorful and perfect for statement looks. There's a mixture of textures and finishes that compliment each other to create a simple but sophisticated makeup. The collection consists of 2 Chroma Eyeshadow Palettes, Warm and Cold; 4 Ombré Hypnôse Eye Kajals, 4 Lip Duo Kajals, 4 L'Absolu Rouge Chroma Lipsticks, 3 Matte Shakers, 4 Le Vernis Nail Polishes, a purple Monsieur Big Mascara, and, my personal favorite, the Cushion Highlighter Chroma. The collection is inspired by the Lancôme Rose, turned into a color block design with vibrant pink and orange that stands out immediately. The idea is to create bold but wearable looks in simple steps. La Colección de Otoño de Proenza Schouler con Lancôme es muy colorida y perfecta para hacer looks statement. Hay una mezcla de texturas y acabados que se complementan para clear un maquillaje simple pero sofisticado. La colección consiste en 2 Chroma Eyeshadow Palettes, Warm y Cold; 4 Ombré Hypnôse Eye Kajals, 4 Lip Duo Kajals, 4 L'Absolu Rouge Chroma Lipsticks, 3 Matte Shakers, 4 Le Vernis Esmaltes, una Monsieur Big Mascara morada, y, mi favorito, el Cushion Highlighter Chroma. La colección está inspirada por la Rosa de Lancôme, convertida en un diseño de color block con rosa y naranja llamativos que la hacen destacar de inmediato. La idea es crear looks intensos pero usables con pasos sencillos. The Warm Chroma Eyeshadow Palette has a range of pink and orange shades with a bold, kind of desaturated blue color. There's a mixture of creams and silky powders with an insane color payoff. It comes with a brush that picks up the perfect amount of product. I also received the Black Ombré Hypnôse Eye Kajal, which has a thick point and a very matte finish. My only concern with this product is that, the more I use it, the less pointed it will be and it might become harder to use by itself. The Matte Shaker in Minimal Ocre matches perfectly the colors in this palette, it's a deep reddish hot pink that screams Autumn and Summer to me. I even used it as a blush to tie in my look and I loved the result. My favorite product from what I tried has to be the Cushion Highlighter Chroma, it has a beautiful finish and blends in with the skin seamlessly, the color is a bit of a light champagne. La Paleta de Sombras Warm Chroma tiene una gama de tonos rosas y naranjas con un intenso y algo desaturado azul. Hay una mezcla de cremas y polvos sedosos con una pigmentación intensa. Viene con una brocha que toma la cantidad de producto perfecta. Recibí también el Black Ombré Hypnôse Kajal, que tiene una punta grueso y un acabado muy matte. Mi único problema con este producto es que con el tiempo se vaya achatando y sea difícil de usar por sí solo. El Matte Shaker en Minimal Ocre combina perfecto con los tonos de la paleta, es un rosa potente rojizo que me grita otoño y verano. Incluso lo usé como rubor en mi look para atarlo todo junto y amé el resultado. Mi producto favorito de lo que probé tiene que ser el Cushion Highlighter Chroma, tiene un hermoso acabado y se mezcla con la piel sin dejar rastro, el color es algo como un champagne clarito. This collection is available now and everything is Limited Edition. If you want to get something from this collection I'd say go for the Highlighter, definitely. The eyeshadow palettes are really nice too, especially because of the mixed textures. The Cold palette has deep purple shades and it would look great for night out looks. Esta colección ya está disponible y todo es Edición Limitada. Si quieres comprar algo de esta colección yo diría que fuera el Iluminador, definitivamente. Las paletas de sombras también son muy lindas, en especial por la mezcla de acabados que tienen. La paleta Cold tiene tonos morados intensos y se vería muy bien para looks de noche.